In some circumstances, rules for the calculation of transportation charges cannot be defined in advance. In this situation, companies may need to manually define the rate based on the information received from transporters/carriers. The manually defined rate should then be recorded in the system, so that freight bills and related invoices can be matched and reconciled. The Transportation module allows to handle manual rating for both inbound and outbound processes. The following sections illustrate the step by step procedure and required configuration to apply manual rating to outbound transportation (Sales order). Routes form and Route rate details form open. In Route rate details, press New, enter rate type “Rate”, rate amount of 100,00 USD. Close the form. Refresh the Route form. . It will show Rate of 100 in Rate, while Shipper rate and Customer rate are set to Zero on the Header. Execute warehouse work (pick and put). From Load planning workbench, confirm outbound shipment. Re-open the Route. The system has maintained the manual rates and applied to Shipper and Customer the same rate. Shipper and Customer rate have been set to 100. The system is updating these fields during shipment. 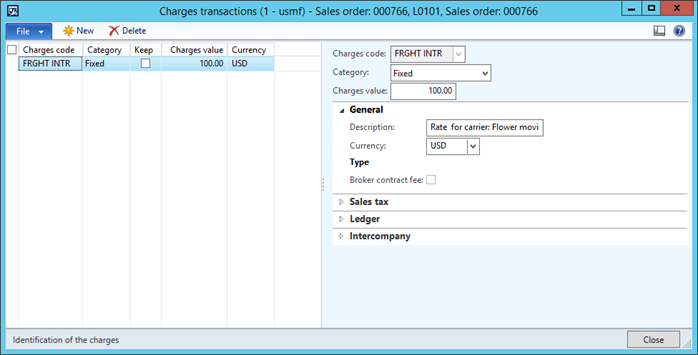 From Sales line, press Financial -> Maintain Charges à transportation charges have been allocated to sales lines. The invoice is generated for the amount of 100,000. Check that vendor invoice has been generated. 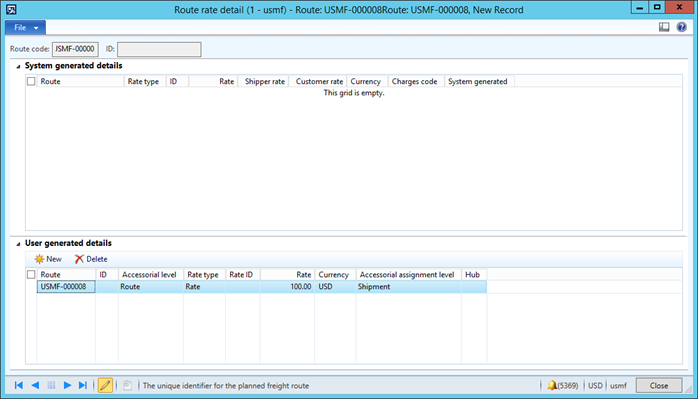 It is not possible to overwrite rates in the Routes form after shop rate. If the rate is not marked as Manual (see the Manual checkbox in Route header), then AX will recalculate it when confirming the outbound shipment. The only way to avoid that the rate is recalculated is to manually set it in Route rate details as a User generated rate.